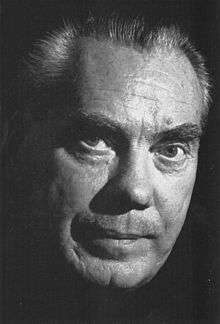 Artur Lundkvist (3 March 1906 in Perstorp Municipality, Skåne County – 11 December 1991 in Solna, Stockholm County) was a Swedish writer, poet and literary critic. He was a member of the Swedish Academy from 1968. Artur Lundkvist published around 80 books, including poetry, prose poems, essays, short stories, novels and travel books, and his works have been translated into some 30 languages. He is also noted for having translated many works from Spanish and French into Swedish. Several authors he translated were later awarded the Nobel Prize in Literature. He married the poet Maria Wine in 1936. Artur Lundkvist published his first book of poems Glöd (Glowing Embers) in 1928 and contributed to the important anthology Fem unga (Five young men) in 1929. He was one of the dominant figures in Swedish literary modernism, the most vigorous promoter of the modernist breakthrough that took place around 1930, and one of the leading poets of the period. His early works was influenced by Scandinavian and American modernists, most notably Carl Sandburg, and later by surrealism. In the late 1940s his works became increasingly influenced by Spanish language writers like Pablo Neruda and Federico García Lorca, whose poetry he also translated to Swedish. Although he continued to publish books of poetry, including Liv som gräs (Life as grass, 1954) and Ögonblick och vågor (Moments and waves, 1962) which by many is considered to be among his finest works, prose works dominated his writings from the 1950s and onwards. In several books, starting with Malinga (1952) and leading up to late works such as Skrivet mot kvällen (Written towards the evening, 1980), his ambition was to defy genre limitations and merge prose poetry, fictional stories, short essays, personal memoirs and impressions from his many travels around the world into a new form of literature. Artur Lundkvist was a very productive writer, and also published numerous articles and short stories, several novels and collections of literary essays, and books about his travels in South America, India, China, the Soviet Union and Africa. In 1966 his autobiography Självporträtt av en drömmare med öppna ögon (Self portrait of a dreamer with open eyes) was published, and in 1968 he was elected a member of the Swedish academy. In 1977 he was awarded the prestigious Golden Wreath of the Struga Poetry Evenings festival in Struga, Macedonia. Artur Lundkvist was a supporter of the Soviet Union and communism. Lundkvist himself, however, never accepted to be labelled as a communist but called himself a "free socialist". During the Cold War, Lundkvist was an adherent of the so-called "third stance" (Swedish: tredje ståndpunkten) in Swedish public debate, which purported to advocate a neutral stance in the conflict between the two superpowers. He served on the board of the pro-communist Sweden-GDR Association. He was also a member of the Swedish Peace Committee, the Swedish section of the World Peace Council, a Soviet front organization. In 1958 he was awarded the Lenin Peace Prize from the Soviet Union. 1 2 "Artur Lundkvist". Struga Poetry Evenings. Retrieved 11 December 2013. ↑ Espmark, Kjell (1964). Livsdyrkaren Artur Lundkvist. Bonniers. p. 379-390. ↑ Espmark, Kjell (1989). "Artur Lundkvist: en värld i rörelse". Den svenska litteraturen. Modernister och arbetardiktare. Bonniers. ↑ Lundberg, Johan, "Ljusets finder" (Timbro, 2013), p. 89-103. ↑ Lindblom, Paul (1991). Samtiden i ögat. En bok om Artur Lundkvist. Tidens förlag. p. 137. ISBN 91-550-3535-3. ↑ Häggman, Bertil (1991). Medlöparna (in Swedish). Stockholm: Contra. p. 74. ISBN 91-86092-22-7. ↑ Yearbook of the Great Soviet Encyclopedia (in Russian). Moscow: Sovetskaya Enciklopediya. 1959.